Just want to say I'm a big fan of your great Rolex-blog and of course of Rolex watches, too. I love to read all the great stories about Rolex, it doesn´t matter if it's about the past or the present time. I learnd a lot about the Rolex history from your fantastic page and I hope you will not stop writing soon. For over 12 years I've been interrested in mecanical watches and I owned a lot. But after all it always comes to Rolex. All the things that are used for todays watchmaking were invented or developed by Rolex, like the selfwinding movement, the screw-down crown and case backs that make a watch water-resistant, and even the date shifting at Midnight and so on. Plus the great history, from helping Panerai build a divewatch to Comex and developing the Seadweller out of the great Submariner, wich I like the most. And that are only a few things, as you know better. However, I just want to let you know, that I´m enjoing reading your great RolexMagazine, keep going this way . 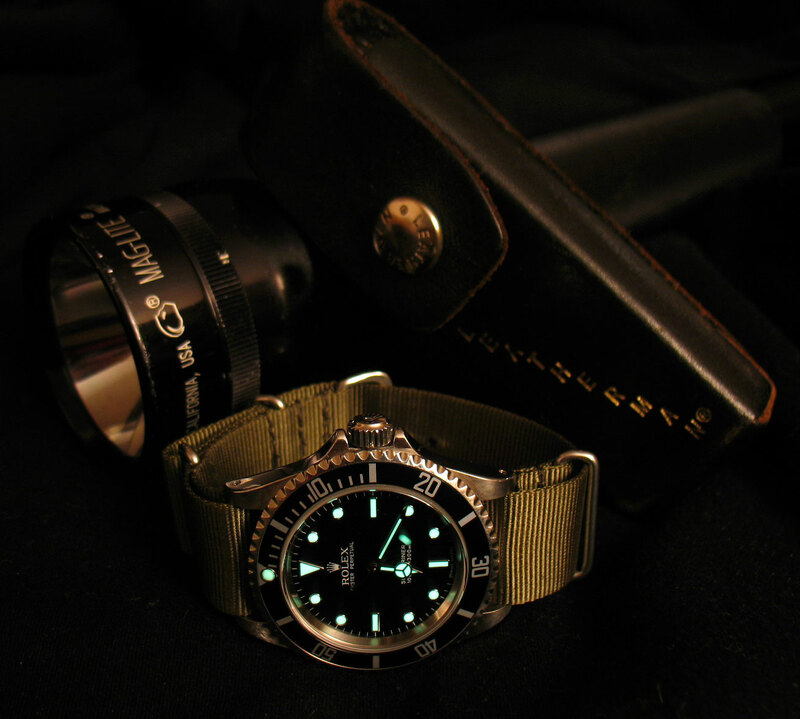 I send you a kind of a loomeshot of my 14060M, that I´m wearing sometimes on a Nato-strap as you can see. In the back there is an old-school Mag-Light without LED-technic and a first Generation Leatherman Supertool. Famous stuff from the USA. Greatings and best wishes to you in USA from Ralf, Germany.